Stanislaus County is a slim sliver in the middle of the Central Valley, although it has foothill habitat in its western third. There, Del Puerto Canyon Road is a famed birding route through dry arroyos and oak woodlands. Much of the rest of the county is agricultural but the Modesto wastewater ponds attract waterfowl and waders, as do flooded fields that appear randomly with agricultural practices. Orchards and riparian along the Stanislaus River provide additional habitats. County statistics and links are on Joe Morlan's site. 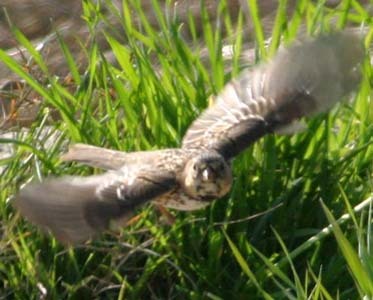 A tremendous amount of information on birding in this county, including sites, local birders, and records, is on the Stanislaus Aububon website. For Stainslaus County, I chose this evocative shot of a Yellow-billed Magpie, taken out the car window during a chase of a vagrant Harris's Sparrow (below right). I loved the old post on which the magpie was perched, with its yellowish lichen, and the clean shot of the bird in profile. 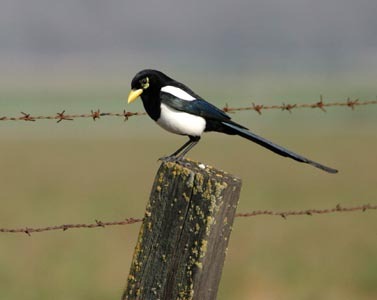 Unfortunately, there was barbed wire fence behind the magpie (below left), which I have removed via PhotoShop. With that adjustment, the background highlights the bird perfectly. In my experience, it is not easy to photograph magpies. They are exceptional tame at some locales but there they are usually on manicured grass or other unattractive substrates. Out in the 'wild' oak woodlands, they have proven to be very camera shy. So I was very happy to snap this shot before the bird flew off!